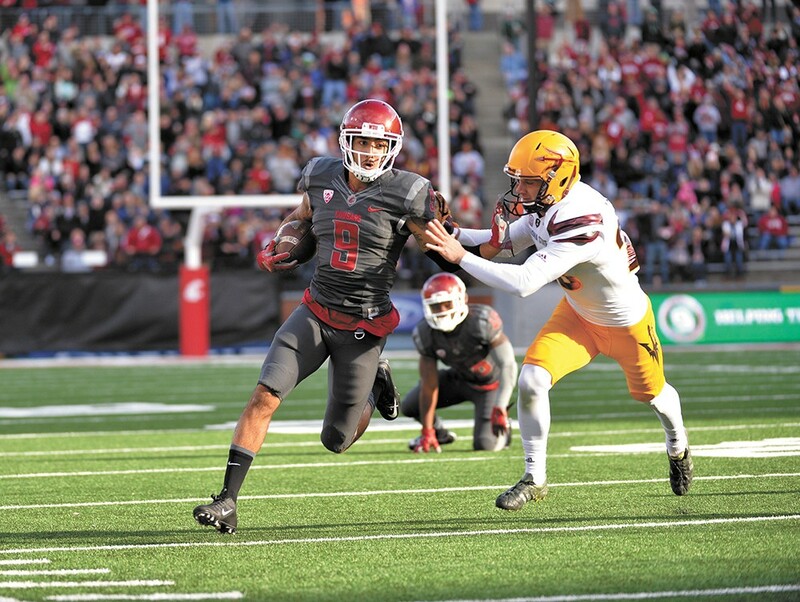 Receiver Gabe Marks and the potent WSU offense head to El Paso for the Sun Bowl. Washington State quarterback Luke Falk says that he likes to sleep at least nine hours a day. Falk should be able to catch plenty of Z's this week, because no one seems to be making much noise about the Sun Bowl. Thousands of the 12,000 tickets allocated to WSU and Miami (6,000 apiece) have gone unsold. Vast expanses of the 51,500 seats at the Sun Bowl figure to be unoccupied when the Cougars and Hurricanes clash Saturday in El Paso, Texas (11 am, CBS). Reasons for tepid fan interest are plentiful. For starters, only 47 of the 127 Football Bowl Subdivision teams do not play in bowl games. Many fans balked at spending Christmas out of town. Plus, airfares to El Paso range from pricey to preposterous. But let's not get too down. After all, the Cougars are in a bowl for just the second time since 2003. The Sun Bowl features two 8-4 teams, though neither is ranked in the Top 25. The Cougars finished the regular season with an ugly 45-10 loss at Washington. Miami is 4-1 since interim coach Larry Scott replaced the fired Al Golden (newly hired Mark Richt won't coach in the game), but the Hurricanes have lost five consecutive bowl games. Both teams prefer to move the ball through the air. Miami has the statistical edge on defense, but Pac-12 offenses are considered superior to those in the ACC. Special-teams play has been unspectacular on both sides. 1) WSU's offense ranks first in the nation in passing and last in rushing. Miami's defense ranks 29th against the pass and 106th against the run. 2) WSU is first in red-zone scoring percentage. Miami is 108th in red-zone scoring percentage defense. 3) Miami ranks fifth and WSU 101st in turnovers lost. 4) WSU ranks 10th and Miami last in least penalty yards per game. 5) The Cougars are seventh in tackles for loss, and Miami is fifth in TFLs allowed.